The Great White Fleet, Waikiki, 1908. The World Cruise of the Great White Fleet : Honoring 100 years of Global Partnerships and Security. Foreword by Donald C. Winter. Naval Historical Center, Department of the Navy, Washington, D.C., 2008. 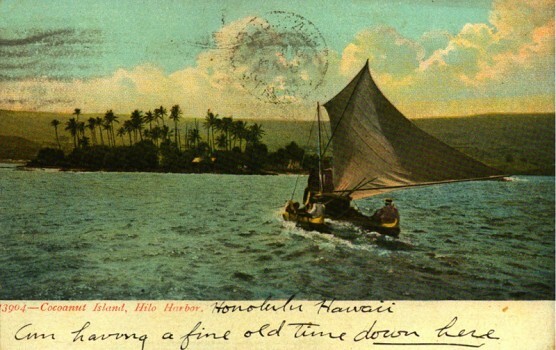 The Great White Fleet circumnavigated the globe in 1907-1909 as a demonstration of the naval power of the United States, visiting Oahu, Hawaii, between 16th and 22nd July 1908. 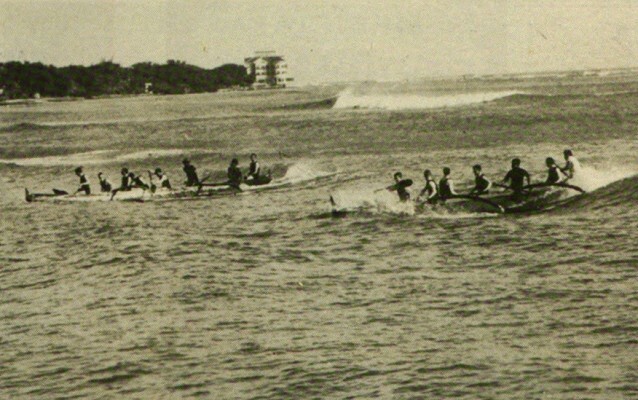 To celebrate the occasion, a canoe and surf-riding regatta was held at Waikiki on the 19th July. Representing the recently formed Outrigger Canoe Club, "Kenneth Winter and Sam Wight, on their long, heavy boards" easily won the surf-board contest. 1908 Roman Miller : The Great White Fleet Log. 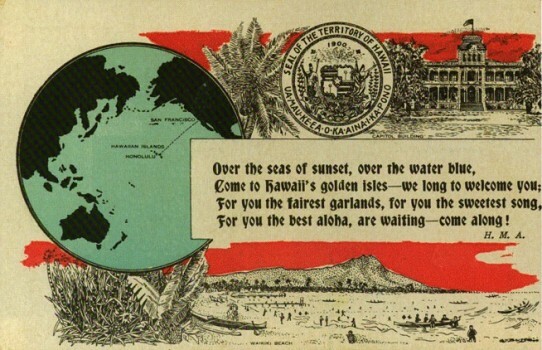 For you the best aloha, are waiting - come along ! Naval Historical Center, Roy W. Davis Collection. One of the great sports is to get a canoe made of a tree trunk hollowed out with an outrigger lashed to it and go surfriding. The game is to get five or six in a canoe and paddle out about a mile. If things are properly timed a big wave catches the canoe and curved on the shore side and shoots it along the front of it. Sometimes you can go half a mile and you go like the devil. - Lt. Edward S. Willing, USMC, in USS Illinois, to his father, July 20, 1908 (Willing, 26). Geoff Cater (2016) : The Great White Fleet, 1908.